We’re proud to announce that we’re now offering the Vera Wang Wedding Stationery Collection at Hyegraph located at 3 Embarcadero Center in the San Francisco Financial District. Vera Wang’s distinct fashion style have made her a house hold name. 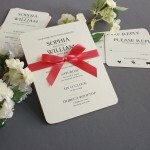 We now offer her complete stationery set including save the dates, personal stationery and business stationery. Her Wedding Stationery Collection includes, save the date cards for destination weddings, pre-wedding celebrations such as bridal showers, engagement parties and rehearsal dinners. Vera Wang’s distinct colors and patterns make her designs lavish and bold yet understated with elegant tones and hues. Her envelope lining and ink colors are all soft and elegant with colors like amethyst and raspberry. 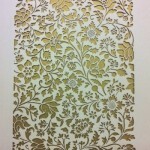 Her ink selections include “white” in foil, “no ink” in letterpress and “platinum” thermography. These elegant options and designs will add an understated elegance to the bride or planner planing her next wedding or the next event. 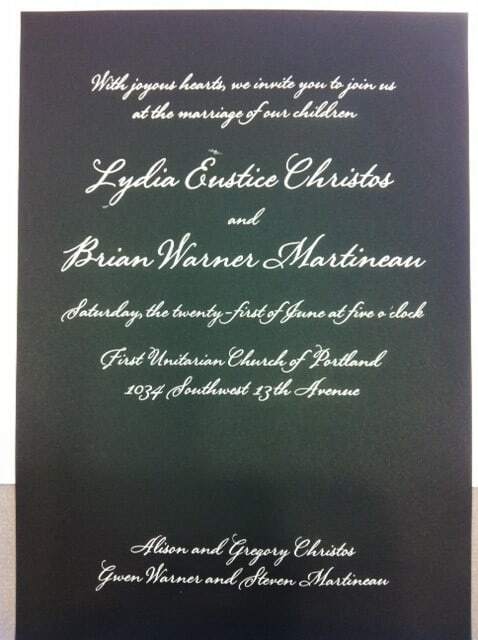 The above Vera Wang Wedding Invitations is on fine William Arthur stock in black with engraved eggshell ink. Price for 100 Engraved cards with envelopes is $521. For more pricing and customization please call or email us. 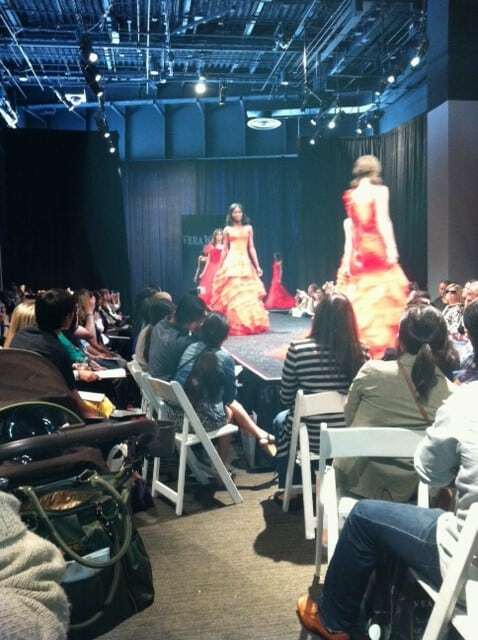 We were recently at the Vera Wang Fashion show which was presented by Bridal Galleria and Unveiled at the City View at Metreon. The show consisted of 14 Vera Wang gowns worn by the original Vera Wang models as shown at the New York City Fashion Show. 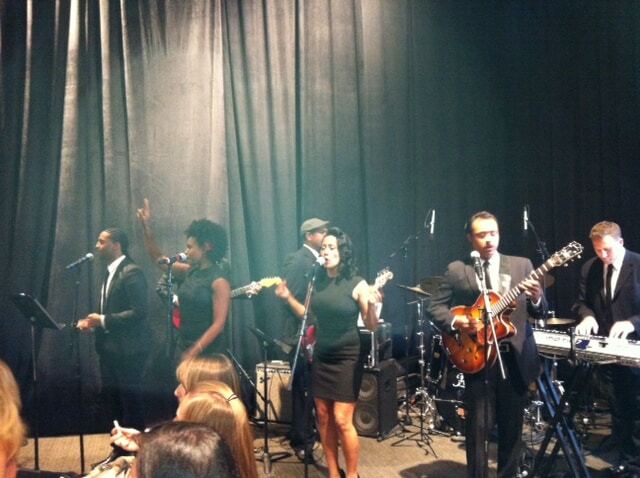 Guests were entertained by Elan Artists while waiting for the show to begin. The models all had their hair parted and tied in two like little school girls wearing minimal makeup promoting all the attention to the main attraction, the gown. The colors in the collection consisted of Cardinal, Dahlia and Crimson. The ball gown styles showcased were strapless, mermaid, and one shoulder. The Vera Wang Stationery collection is understated and muted with vibrant colors and motifs. She has made a point of having a separate book for party invitations, personal stationery and business stationery. So for those clients who prefer designer stationery with high quality from William Arthur, the Vera Wang stationery collection is a great option with great value.